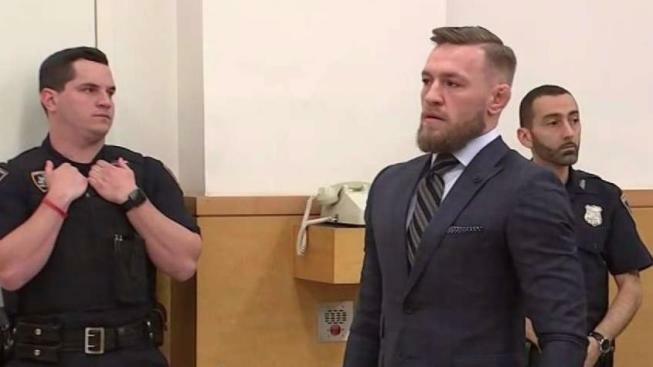 Mixed martial arts star Conor McGregor has pleaded guilty to disorderly conduct in exchange for community service to resolve charges stemming from a backstage melee at Barclays earlier this year. The 30-year-old Irish fighter was joined on Thursday in Brooklyn court by his 25-year-old friend and co-defendant Cian Cowley, who got three days of community service and anger management. UFC released a slickly produced video showing the rampage from several camera angles, including from inside the bus. McGregor has expressed regret, saying after his last court appearance in June that he understood the seriousness of the matter and hoped to resolve it soon. Last week, he attended the World Cup final as Russian President Vladimir Putin's guest. McGregor hasn't fought for UFC since November 2016 and was stripped by UFC President Dana White of the 155-pound championship he had never defended. McGregor last fought in a boxing match he lost to Floyd Mayweather Jr. last August.